I cook a lot—everyday, sometimes all day. Baking in the morning, making breakfast, preparing lunches for my daughter and myself, then dinner and in between some other dish that I'm playing with. I begin each recipe chock full of optimism that this is going to be the tastiest dish ever and when it's not, I'm woefully disappointed and hell-bent on working the thing until it is and then I'm so sick of it that I'm sure not make it again for a very long time. Are other people like that? Did Pete Sampras tire of his serve? Does Thomas Keller still like his little caviar cones? Is Martin Scorcese bored with his nightclub sequence shot in "Goodfellas"? Am I comparing myself to these titans of their profession? No, no, heavens no. But I do think that, for the average Joe or Joanne, that's why cooking can be a drag—all that effort for dishes that often aren't as good as a frozen pizza, cold sandwich or any number of take-out options. 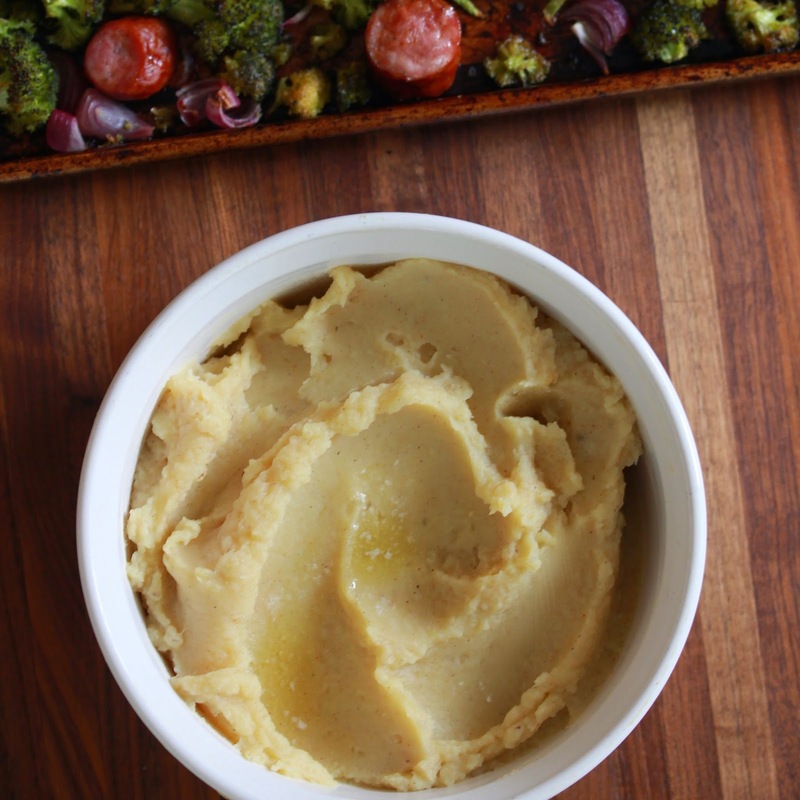 Here's a meal that's simple and economical. Not a mind-blower but does provide tasty, straightforward sustenance and hits your basic food groups and the need for textural variety. A good week night staple. One pan to roast the vegetables and sausage. One pot to boil and mash the potatoes. A ricer if you want to get fancy (and fluffy) mash. 1. Preheat oven to 400º. Toss broccoli florets and onions with olive oil, juice from lemon (and pulp if you really like lemon) garlic, salt and pepper. Spread onto sheet pan. 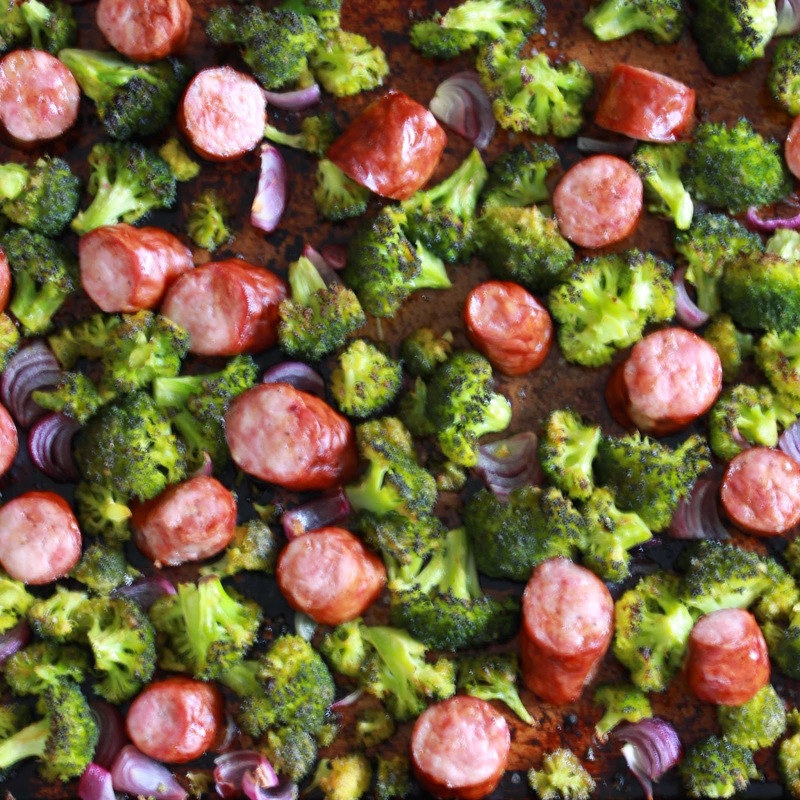 Cut sausage into one inch chunks and add to pan, spacing them out so they flavor the vegetables as they cook. Roast for 20-25 minutes, stirring halfway through, until broccoli is a little brown and sausage is fully cooked. Serve hot. 1. Peel and cut potatoes into chunks then place in saucepan, cover with water and heat over medium until fork tender. Meanwhile warm up milk and butter in separate pan or in microwave. Pass cooked potatoes through a ricer or mash well with a masher adding milk mixture and spices until you get the consistency you like. Top with extra butter and serve hot.